You might be thinking that professionals with skills in Artificial Intelligence will rule soon. After all, AI techniques has many benefits. It can even increase labor productivity by up to 40%. Machine Learning and AI have started finding their place in every job around the world. From self-driving cars to detecting diseased cells in body and fraud detection to product recommendation, AI plays its role everywhere. “Cloud computing is empowering, as anyone in any part of the world with an internet connection and a credit card can run and manage applications in the state-of-the-art global data centers; companies leveraging cloud will be able to innovate cheaper and faster.” And that’s the reason why the world is turning towards cloud-based services. The demand of cloud engineers, thus, is on the rise. While you fear losing your job to robots, research by Gartner Inc states that although AI will eliminate 1.8 million jobs by 2020, it will also create 2.3 million new jobs. In the present scenario where, more and more companies are investing in AI technologies, it’s but natural that they would need AI-skilled professionals. In the current fierce competition, someone who thinks “better” gets an edge. And that’s why analysts are there – To analyze the huge data available and make better decisions. People don’t like to work under bosses, they look for leaders. Someone who can motivate them to perform better, show them the way. And it’s a skill not many are proficient with. There has been a time when web and app development was a new thing. People loved whatever you came up with. But now, almost 60% of the users said they wouldn’t recommend a business with a badly designed website. The number of mobile users is growing, and while businesses are coming up with mobile-friendly websites, it’s the mobile apps which give users a more personalized experience. Vlogs, explainer videos, video tutorials, product demos and reviews, live streams and everything else related to videos. People love them all. Also, videos increase brand awareness by 54%. 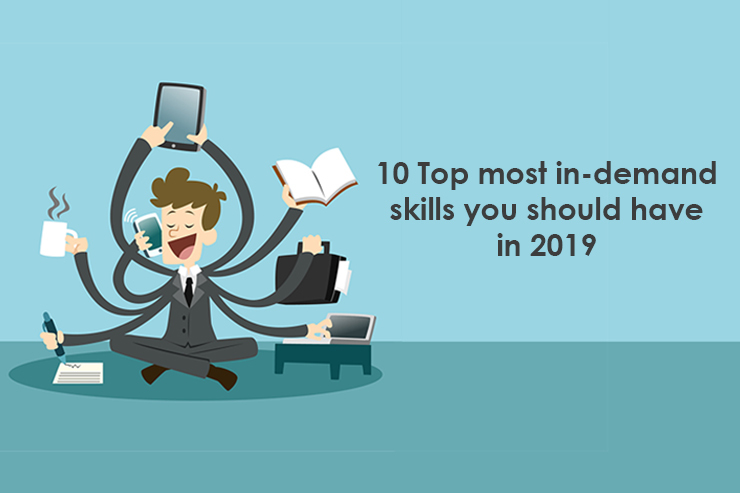 Those were some of the in-demand hard skills for 2019. You can learn them, become a maestro over time but to excel in a role you also need soft skills. After all, 57% of business leaders say that soft skills are more important for a job than hard skills. But why? Because it’s you, your thinking and behavior that makes a significant impact. Hard skills give you the ability to do a job but how well you do it, depends on the soft skills. Your etiquette, approach towards work, adaptability, flexibility and many other personality traits help you in any role you take in any industry. While robots are doing great with automated tasks, they’re still far from developing innovative solutions for a company. That’s a reason why creative people are in huge demand. Creativity, however, isn’t required for problem-solving only. Repetitive and dull tasks too require you to have a creative mindset to make them look interesting. A great product and a great team aren’t the only things required for the product to be successful. There should be someone who can influence people to go forward and make them more productive. A person with persuasive skills is required to increase sales, to raise funds, to convince stakeholders and in many other daily operations. With the growing complexity of work, a worker needs to coordinate well with other team members. Be it development projects or marketing, a team player is needed to align well among people with different priorities and personalities. Thus, a collaborative skill is a must have to make any project successful. Yes, companies require not only geeks for projects but also those who can communicate well with others. They need people who can think out-of-the-box and not like a machine. So, which of the skills do you think you’re missing? Which ones are you going to learn first? Take some out of your busy schedule and start learning. You don’t have to worry about the fees and other expenses. Monexo works to provide easy education loan in India. Monexo is an online P2P platform which provides personal loan for education. The process is simple, easy and being completely online, you don’t even have to sweat to get approved. With bare minimum documents and a wait of a few hours, you will get the loan you require to learn new skills. Keep learning, keep earning. If you’re looking for an instant personal loan, apply at Monexo- P2P lending and enjoy hassle free borrowing.